Bodyweight training has its own set of rules when it comes to things like progressions, 1RMs, reps, and rest. Learn the ropes from the man who teaches bodyweight mastery worldwide! Over the last few months I&apos;ve been getting more emails than ever, but often the same questions keep coming up. And for every person who writes to me, there are probably 20 more thinking the same thing but just not bothering to type out a message. That&apos;s a big part of why I love to publicly answer questions I get from my readers! In this edition of Ask Al, I discuss everything from how to get better at pull-ups, to how to use speed to your advantage, to why I&apos;m such a big sellout. I&apos;ve been training pull-ups for almost a year now. When I first started I went from 2 pull-ups to 10 in only a few months. I&apos;ve been stuck at 12 reps for the last two months. What should I do? Try doing a set of Australian pull-ups immediately after a set of standard pull-ups. Take a long break, then repeat the superset again. It&apos;s a great way to keep working your pulling muscles beyond failure once you can no longer perform any more pull-ups. You can do this 3-4 times in a single workout, but make sure you give yourself a few days rest afterward. I work a job where I spend several hours a day loading boxes and moving things. I want to start training calisthenics, but I&apos;m worried about overdoing it. What do you recommend? Well the good news is you&apos;ve probably built a decent base of strength already just by being active on a regular basis, but it&apos;s great that you want to do more. I recommend starting with just one or two days each week of bodyweight work to give your body time to adapt. Try doing your workouts on days where you don&apos;t have to work, so your muscles have recovery time. Ideally if you have two consecutive days off, do your workout on the first day and then take a rest day the next day. Since you&apos;ll only be able to train a couple of times per week, full-body workouts are going to be the best way to go. You might eventually build enough strength and stamina that you can add in more days of training and possibly train calisthenics on the same days that you have work, but you will see how that goes as you progress. Be patient, respect your body, and give yourself recovery time when you need it. I read somewhere that it&apos;s best to exercise slowly when practicing calisthenics for strength, but I see most people cranking out their push-ups as fast as possible. Which is the right way? Though some coaches insist on slow, deliberate reps for strength training, I believe that there&apos;s room for variety when it comes to rep tempo. Super-slow training can definitely help build control and stability, especially when you&apos;re working through the sticking point on certain difficult exercises, but it&apos;s not the only way to approach your training. For example, explosive movements like jump squats and clapping push-ups are better for building power. In my opinion, it&apos;s good to practice your exercises at different tempos. Once you&apos;ve honed a move, you should be able to control it and make it graceful at any speed. I read an article you wrote that basically said training certifications are a bunch of crap. It seems a bit hypocritical to now offer your own cert with the PCC. I mean, really, a certification in bodyweight training? I&apos;m flattered you&apos;ve been following me closely enough to have read those earlier writings. You actually remind me a lot of myself—I&apos;m always questioning everything! I bet we have a lot in common. And you&apos;re right, there are a lot of crappy PT certs out there. That&apos;s part of why I wanted to do the Progressive Calisthenics Certification. Though it may seem unnecessary to you, with the current popularity of calisthenics training, the demand for a bodyweight strength certification was undeniable. It was going to happen eventually with or without me, so I figured, who better than me to teach it? Mahatma Gandhi said: "Be the change you wish to see in the world." By leading my own certification, I can personally make sure that quality knowledge is bestowed and high standards are upheld. PCC has a physical test to establish a baseline of competency in performing the fundamental exercises, something that is lacking in almost every mainstream fitness certification. It&apos;s scary that there are personal trainers out there incapable of doing proper pull-ups or even bodyweight squats, and who got certified simply by memorizing and regurgitating information. That&apos;s why a theoretical understanding of exercise will never be enough to pass the PCC! I&apos;ll still be the first one to tell you, however, that just having a certification—even the PCC—doesn&apos;t mean that you are going to be a successful trainer. I can help point people in the right direction, but it&apos;s up to each individual to take the journey for themselves. In fitness and in life, we&apos;re all personally responsible for our own success or failure. Reports of stretching&apos;s demise have been greatly exaggerated. In this excerpt from Al Kavadlo&apos;s new book, the bodyweight training chief helps you build an effective, personalized practice! Don&apos;t believe that high-level calisthenics are only for athletes who look a certain way. 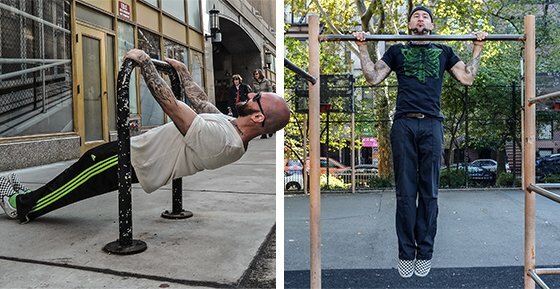 Everyone can benefit from the unique challenges that come with bodyweight training! Sometimes the toughest strength moves don&apos;t involve any iron at all. Heed the call of the one-arm push-up and discover how tough progressive calisthenics can be!